This is definitely a nice gba demo, sure it could have been alot better designwise but some of the effects are good and the 3d engine is really fast so overall the production is far from bad. Keep up the good work and i'm sure that your next production will be even better. This was a really nice surprise! Some sweet effects and even more sweet music. Only some of the textures could have been better. i like this quite alot, very relaxing demo. sweet colors, nice effects and especially great music! only bad thing is 2x pixels in many 3d objects (makes em look uglier). but oh well, should have ranked higher. 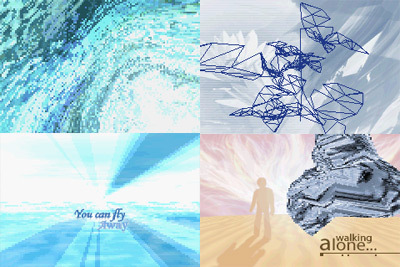 background graphics with tiny effects in front. the latter usually features a buggy polygon and an ugly texture. this didn't really have any kind of design at all but it's always refreshing to see some new gba stuff... keep on doing some more. Very nice effects and music. many effects and a nice soundtrack, thumb up! Thank you for great comments. We are glad you like our first (and, hopefully, not the last) GBA demo. excellent work.. very nice feel to the whoe production. The music, graphics and effects are all sweet. Surely one of the best GBA demo`s to date! i am really waiting for your next gba-release! i don't understand those ugly morphing objects and i don't like the style, but otherwise this is excellent and promising. great chilly atmosphere thanks to the good tune, smooth effects (2x2 or 2x1 does not really bother me on such a small screen... and always better than a crawling 1x1) and some nice design touches (like the synch during the 'you can fly' part). The only part I dislike is the dot landscape, which does not fit with the rest of the demo and looks outdated compared to the other effects. but next time dont include the naked chicks pls! Clearly one of the finest GBA demos to date. Nice bkground graphics, nice design, nice FX. More! Beautifull music, very good theme-feel. excellent, a lot of amiga 90's flavour here. Nice. Graphics are ugly indeed. Just watched this again. It's lowres, but probably the best feel-good demo there is for GBA, even if cheesy as hell.